Ever since moving to Cornwall, I’ve been itching to see a Basking Shark. I even fell over and hurt myself on the coast path once because I was concentrating more on hopefully gazing out to sea than on where my feet were going. 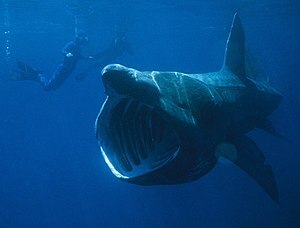 Basking Sharks are in My Cornish Ark (see my earlier post), and deservedly so for such an amazing big fish. And now, at long last, I’ve seen one! And not from the top of the cliff, but from a boat, really close. I was with a group of students from Exeter University’s Cornwall Campus – they’d been working on an end-of-term project considering the challenges in balancing growth and conservation – and we were all really excited, as none of us had seen one of these magnificent creatures ‘in the flesh’ before. 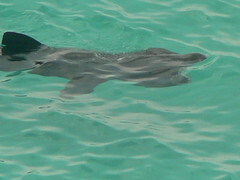 At one point the shark was swimming slowly towards us giving us a clear view of its wide-open plankton-filtering mouth. Incredible! Basking Sharks (Cetorhinus maximus) are the largest fish in the seas round our coastline, visiting us in spring and summer, and can reach up to 12 m in length. They might be big, but they are harmless, feeding as they do on plankton. They are also still somewhat mysterious, and we are only just beginning to understand their life history better. A protected species since the late 1990s, this would appear to have resulted in an increase in numbers compared to when they were hunted commercially for meat and oil in the twentieth century. Recent research confirms this, highlighting the seas of the South West coast of Britain as one of three Basking Shark ‘hotspots’. Taking a wildlife boat trip out of either Penzance or Falmouth will give you a reasonable chance of seeing one at the right time of year. I took my trip with AK Wildlife Cruises from Falmouth Docks – you can follow them on Facebook for lots of information on sightings and comments from the knowledgeable team. You can find out more about Basking Shark biology and conservation from The Shark Trust or the Marine Conservation Society. But do get on a boat and go looking!